Tattoos are a big rage among today’s youth as well as adults. They have become the latest style statement. People love to flaunt their tattoos, no matter wherever they are. But, often there are times when people want to cover up their tattoos. Even, people who love the inked art on their body, sometimes face situations where they have to hide their tattoos. It can be for a wedding, a formal function, a family reunion, a job interview, or for any other reason. Make sure that the tattoo has fully healed before applying make-up. Normally a tattoo takes 30 to 45 days in healing. Before starting with your make-up, cleanse your tattooed area properly as dirty skin can cause rashes and infections. You can use a wet wipe or a face wash to clean the area. With this, the skin easily absorbs the make-up. Start with applying a light concealer. Make sure that the concealer is a few shades lighter than your natural complexion. Use a make-up brush or sponge to apply the concealer. Once you’ve done this, wait for a minute or two and let it dry. Use a foundation that perfectly blends with your skin tone. You can use any type of foundation, whether a cream based, liquid, or spray foundation. After applying it, use your fingers to spread it evenly. At the end, use a blotting paper. Apply a coat of translucent powder with a large powder brush. This will provide a matte finish to the tattooed area. Finish the make-up by squirting a hairspray over the translucent powder. This will set the make-up in place, so that it does not spoil your clothes or any other thing. Before touching or covering it, make sure that the make-up has fully dried. To be on the safer side, do a trial run before the actual event. This will give you an idea of how to apply make-up and inform you if it matches your skin tone or not. Also, when you would have tried it beforehand, you will be able to do it much faster. There are various specialized products available in the market, which can effectively hide your tattoos in minutes. Unlike make-up, these specialized products are specifically made to cover tattoos. Also, they take much less time than make-up. 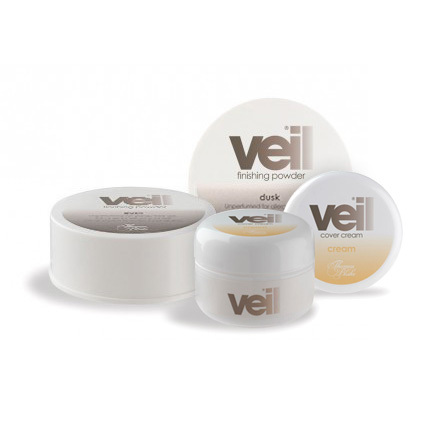 One of the products that we recommend is the Veil Cover Cream. It is very effective in camouflaging tattoos. Veil Cover Cream is a complete tattoo cover kit that includes three different shades of cream that can be combined together to match your skin tone, a finishing powder, a toning lotion, a cleansing cream, two spatulas, an empty jar, and four cotton pads. Veil Cover Cream is absolutely skin-friendly and is suitable for every skin type. With these tips, you can cover your tattoos the easy way. Follow them and look tattoo free in just a few minutes.